Try this Poinsettia Flower Tutorial and get ready for Christmas. Along with the decorations and the mince pies they always give a seasonal feel to a room...especially the mince pies! You can buy these ready made but they can be a little on the pricey side so if you want to add some paper ones to your collection of Card Toppers then the most economical way is to make your own. The little video will show you how to create these very pretty flowers for yourself from a very popular punch that you may already have in your "Stash"
And using the same method that was used to add the summer blooms with the Retro Punch. But please don't forget that these lovely plants don't always have the Red bracts to them. You can get them in pink and also in a very lovely White too. These paper ones have had a Gemstone added to their centre. 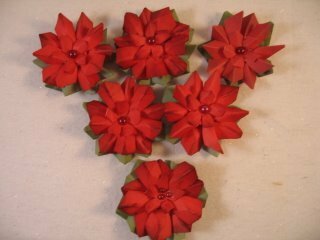 Scroll down to watch the short video tutorial on how to make your own Poinsettia flowers. 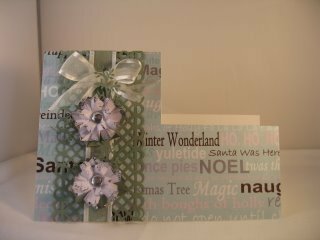 It is a very easy and pretty attachment to all your Christmas Cards. This is just one of many easy ideas for the use of the flowers. 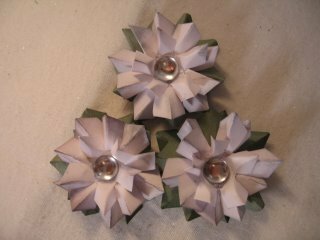 But you could add these flowers to a tag that will be on your Christmas gifts. I hope you have enjoyed this Poinsettia Flower Tutorial and will take a look at some of the others on the website.